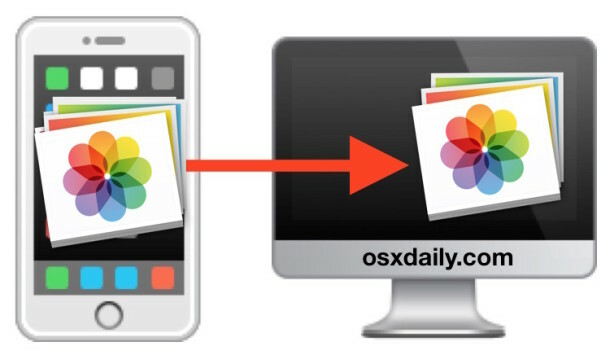 You can easily transfer Photos from your iPhone to your computer, and the process is very similar whether you are on a Mac or PC. The Mac treats the iPhone like a digital camera, and Windows can treat the iPhone as either a digital camera or a file system, depending on how the photos are accessed. Regardless of what OS you are using, to get started you will need your iPhone, the included USB cable, and a computer to plug the device into. There are a few means of copying pictures from iOS to computers, we’ll cover more than one each so that you can decide which method is appropriate for you. We’ll cover the Mac OS X methods of how to copy pictures from an iPhone to a Mac first, and then how to copy pictures from iPhone to Windows methods second. Before beginning, make sure the iPhone is unlocked. 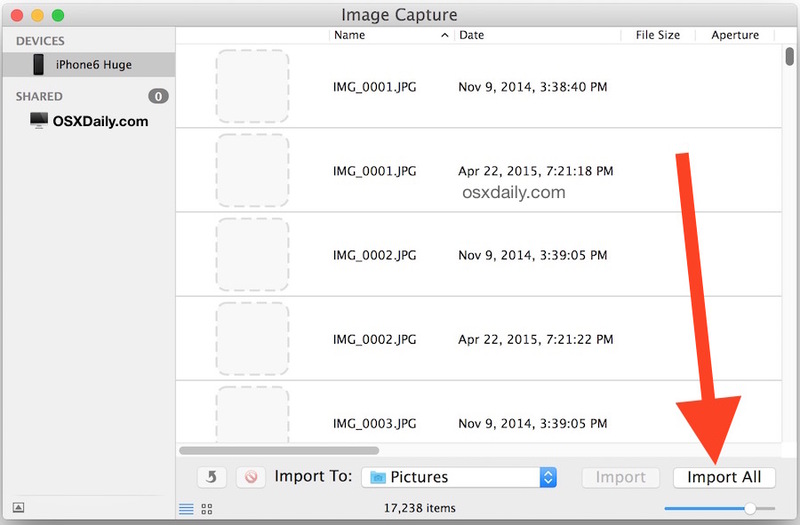 For OS X, the fastest and simplest way to copy pictures from an iPhone to a Mac is with Image Capture and Preview. We’ll discuss how with both apps. 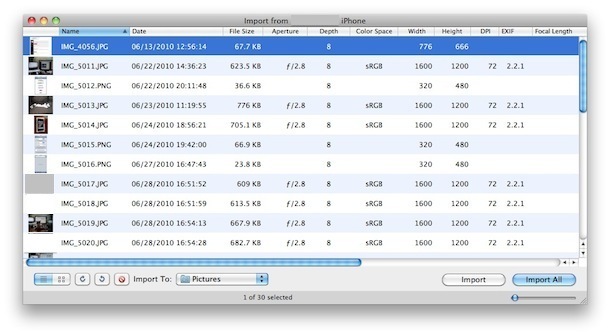 Image Capture is my preferred method because it’s fast, efficient, no frills, and allows users to quickly and easily copy the images from an iPhone (or iPad, or any camera), directly to the Mac. You simply choose where in the file system to copy the pictures, and it transfers them for you. Optionally: Click the checkbox with “Delete after import” if you want to delete the photos after they have been copied over to the computer. The benefit of using either Preview or Image Capture is that these apps are on virtually every version of OS X since from the very beginning of the OS, so you won’t find a Mac version without them. 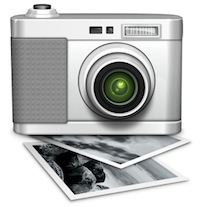 iPhoto on the other hand is generally limited to the consumer model Macs, thus making it not always available on pro models, but it does work as well, and iPhoto will also serve as a photo manager of sorts. On a Windows PC the easiest way to get pictures from your iPhone is to just use Windows Explorer, but there are two ways to go about this. In either case, unlock the iPhone before beginning, or else the photos may not be visible. 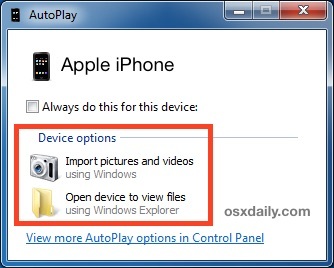 Note that in Windows 10, Windows 7, and Windows 8, you will often find the iPhone mounted under “Portable Devices” but it can also be found listed under “Digital Camera”. Opening either will work to copy the pictures over, but typically Digital Camera opens directly to the DCIM directory whereas Portable Devices will sometimes require minor navigation within the folder to copy the files. The Windows approach treats the iPhone more like a file system, just like it does with standard digital cameras that are connected to a PC. That generally makes Windows even easier for moving pictures back and forth if you like to cut & paste things directly from one folder to another in My Pictures or My Documents. Nonetheless, you can also use your favorite photo importing application to pull the pictures from the device as well. Remember, if the iPhone pictures are not showing up in Windows, make sure the iPhone is unlocked first. Otherwise the iPhone will be found in ‘My Computer’ but all of the content on it will be invisible and inaccessible. If you run into that, all you need to do is touch the iPhone, unlock the screen and enter the passcode, and all of your stuff will be visible as expected. Finally, you can also sync your photos using just iTunes on either Mac OS or Windows but that is more for iPhone backup purposes and doesn’t really serve as a means of accessing individual pictures. Why would you not just drag & drop from the iPhone ? Hah. I used the FonePaw iOS Transfer and it worked well! Thank you Mikey for repeating the advice here. I do not know where you read it from originally, but after I read yours, it works for mine too.” Make sure IPhone is unlocked.” just as simple. thanks to all who shares information. I don’t kow what it means to have “camera unlocked”. And you are very rude!! I too had the same problem but connecting I phone with camera on condition helped. Then it appears on win 7. The iphone shall have to unlocked for camera to be on, incase there is password to unlock it, for some users. My phone somehow locked me out & I never created a password. Is there a way to download the photos onto my computer. Itunes is not accepting it. Apple tech support says they have to wipe everything out on my phone. I must keep my photos! Any ideas. Apple tech says there may be a 3rd party means to do it, but they just can’t approve it. Unlocking doesn’t work. It ask me to trust or don’t trust this computer. When I select trust or don’t trust still no connection. Unlocking before hookup and after hookup no response. Any suggestions? Hi, I encountered the same problem. Make sure you unlock your phone first before plugging it to your computer. It works! It seems so ridiculous, but this was it. The phone has to be unlocked BEFORE you attach it to the computer. Wow, that was a frustrating 15 minutes. Thanks Cairu!! How do you “unlock” the phone…..sorry, a bit challenged! thank you Arun for the question..Thank you so much Cairu for your answer..i did as advised n it worked iv bn struggling for months to import pics. it still does not show any photos into Computer\Apple iPhone\Internal Storage\DCIM. my iPhone was unlocked before i connected it to laptop. Transferring photos to a Mac is transferring photos to a PC. Get it right people. PC represents intel to most people. PC still stands for personal computer. So both Mac and Windows are PCs. Rich got it right. The rest of you just don’t get it! Only an apple user would incorrectly assume they have a pc. how very rude you are. Do you talk to people like this all the time? Bet you don’t have many friends! So you would think. But I think if you ever call your MAC a PC, the MAC purist is going to kill you. No, rich got it wrong. Consider Mac’s own advertising campaign against all non mac machines… they’re referred to as PC’s…! Even Mac makes the distinction between itself and pc’s… I think we all comprehend the fact that the acronym “PC” literally stands for “personal computer”, however, in the portion of the public sphere that is not stupid, we who have normal reasoning capabilities are able to connect the dots between the usage of the term “PC” and its correlation to non-mac computers. If I made a car called dyorkisamoron, then advertised it as “It’s not a car, it’s a dyorkisamoron” it would still be a car. A Mac uses the same components as any other personal computer, it does the same thing as any other personal computer, and it is, by definition, a personal computer. Of course Apple wants us to think of their machine as a category for itself, it makes it sound way more exclusive. If you tell me that you’ve bought a new mac, then I’ll know that it sure wasn’t Asus. If you tell me that you’ve bought a new PC, I’ll wonder if it was an Apple machine, or an Acer machine, etc. A PC can run MacOS, Windows, Linux, or it can have no OS at all. A PC can be big as a fridge, or fit in your pocket. So it is not only technically that mac is a PC – we who actually know what we’re talking about use the term PC for any PC, because it is a PC. and the Bamberg potato is one of the many different types of potatoes. You are one of the millions of people who got trapped in Steve’s Reality Distortion Field! A Mac is NOT a PC. Not even Apple refer to their products as PC and male the distinction in all their comparative marketing. Apple Macintosh originated from different hardware and was always incompatible by design. The term PC was coined when IBM Personal Computers and their clones were available. At no time was the term PC ever used in reference to an Apple product because it was not IBM Compatible. You cannot simply start referring to an Apple as a PC now that it has an Intel chipset or because it is a personal computer. IBM coined “PC” much the same as Kimberly-Clark coined “Kleenex.” Kleenex is not the same as Puffs – they are both facial tissues, but everyone calls them Kleenex by default because Kleenex used to be the only brand around. Hence, a Mac is not a PC, but they are both micro computers. Actually, Macs have intel chips as well, and many “PCs” use AMD chips. The common view is that “PC” means either anything not Mac OS based OR anything Windows based, depending on who you ask. But technically, Macs ARE PCs if you use the literal translation of the term. IT IS YOU VINIE, WHO ARE STUPID! it uses the same specs as of any pc in the world… the only difference is the program or software(OS) that runs it…. MORON! A Mac is a computer. Any other kind of “computer” is a piece of trash. Snow Leopard, that is quite the unsupported opinion you are spewing. I feel as though the inclusion of your opinion here is completely unhelpful in this situation. I’m sure many people would prefer if you would just keep your uninformed opinion to yourself, seeing as your complete ignorance is distracting to those trying to work towards a solution. Please just continue beating off to a picture of a half-eaten apple, since that seems to be what you enjoy doing (given the wording of your opinion, of course). you have a right to your opinion, but not the right to push it on others. If you were of an age to remember, you would know that Apple INVENTED personal computers with the Apples I & II. However, coming late to the game, IBM launched their offering and called it the IBM PC (notice the capitalization!) Of course, it was meant to denote that they had invented the personal computer (notice the UNcapitalization). Since then anything (and I do mean anything) that followed the same open (wide open) architecture, has taken on the hybrid name Personal Computer (note the capitalization). When Steve acquired the rights from Xerox to adapt the desktop analogy to personal computers, Apple called them Macintoshes (or Macs) so that no one would mistake them for PCs with all their shortcomings, as YOU did. 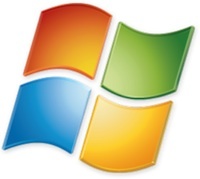 Bill Gates and MS, as they have always done, then copied a good thing, the desktop analogy to create Windows. This saved the PC world from imploding to the superior Macs. But any idiot that insists that a Mac is a Personal Computer is just WRONG. Certainly a Mac is a personal computer, in fact more so than any Windows machine… they are as impersonal as any device can be. This is what I’ve been doing for years. Super fast and efficient. They need to build upon this program and integrate it with itunes to make photo files able to be transfered both ways. Kindof like how you can see your pages and apps in itunes, they really need to make a desktop viewer of your iphone’s photos. Drag and drop into albums, create albums, etc. Expecting people to sync through iphoto or build folders and sync those is seriously absurd. That should be their next major priority, not a iOS update, but a serious overhaul in how you manage its files with itunes. Amen Brother. I havent had an Iphone long and was surprised that is not a part of ITunes. Thank you for saying! Does anyone know if the Preview import also works for transferring HD videos from the iphone4? Yes, Preview can import HD videos from the iPhone. On my iPhone(4) The import all button isn’t there. I’m trying to import about 600 pictures and I can’t highlight them all. On image capture it just stops and says a number. eg. 534 remaining. Please help!!! Thanks for the tip! I didn’t know you could use Preview. iPhoto and Image Capture stopped working for me because I had too many pictures in my Camera Roll. One important thing to note- make sure your iphone is unlocked when connecting to the PC. When it’s locked, computer won’t recognize it, even though the iphone will be charging. Agreed, couldn’t see my iphone until I unlocked it. Excellent, thanks! Diana, that is called genius you have smart brain! great help thanks. Thanks. You saved my life!!! I was trying for hours to copy some photos from my iPhone to the computer and the computer wouldn’t recognize the iPhone until I unlocked it. Thank you very much . This information help lot of ppl even I was tryed couple of days but failed bc My phone was unlocked & try but not working. Thanks a lot for your kind information sharing. Thumbs up for Diana !! Goes to show… usually it’s not the one you pay that helps you the most! thank you for a really helpful tip. this was incredibly helpful.. thanks for sharing! I’m able to import all photos directly from my iPhone 4 camera roll previously, but not anymore. Unlocking my iPhone & connecting to my PC isn’t helping also. Only iTunes indicates the connection now only, but not the desktop auto-wizard & My Computer folder. Why? I have this exact problem down to every detail you described!! Was working perfectly fine automatically synching now suddenly only appears in Itunes, etc., can’t get the pic’s off. Did you find a solution? I was able to get the scanner and camera wizard to appear, but it says that I don’t have any images on my camera. I obviously do. Does anyone have a suggestion for this issue? I tried this method and it works! Click ‘Add’ on the top right corner. > Copy and paste to where you wish to store the pics. I have an iPhone 4 and am using a virtualized desktop (no laptop, no desktop, just a thin client). I’ve connected my phone to the Wyse thin client, and opened Windows to download photos from my iPhone, but cannot see the photos anywhere. Are the instructions below for someone using a Mac or PC? If a PC, I should be able to follow these instrucitons on my thin client but I don’t see “iphone configuration utility.” Can anyone help me download these 200 photos? Windows tells me there are no photos on the phone but I see them clear as day. I don’t have any “iphone configuration utility” on my laptop start menu/ programs. How’d you get that?! Thanks so much – Never took the time to learn how to get the photos from the iphone to the mac. It’s so easy, a very big DUR moment :) again thanks for sharing. my home PC has died with all my personal photos…they are synched to my iphone…anyone know how i can copy all photos (not just those from my cameral roll) from my iphone to another PC that is authorized under my itunes account? Hi just out of curiosity, i was wondering if anyone got back to you on this, as exactly the same thing happened to me, and i don’t want to lose the pics in the albums on my phone. I can get the pics from the camera roll no problem, but can’t seem to get the albums. same here ! Please let me know if u cud figure out a solution for transferring the (not just the camera roll) albums to ur pc from iphone !! Try using DiskAid. You can you use it for free for 14 days. then you can youtube on how to transfer. I did it with my music. They tell you step by step and I am telling you I had no issues at all. I can’t download my pics what so ever. I don’t have mac and I am using windows 2000…I think. PLEASE help! I have over 3ooo pics, help!!! i have 3gs. i have windows 7. when i plug iphone into pc.. nothing happens except that it says my driver isn’t installed properly.. my friend gave me this pc.. i don’t know why this error comes up.. but if i wan to i can open and use itunes with no problem..
when i look through explorer i can’t find the iphone anywhere.. it’s plugged it.. it’s charging.. why can’t i locate it..
i want to take pics off the iphone.. please advise. thanks. what if nothing appears on : My computer?? Wow, thanks for this tip. I usually import into iPhoto and leave them on my iPhone. I never thought to look in Preview to do this. Over the years, I’ve accumulated photos I no longer want and using Preview to delete them is quick and easy. If you open the camera roll on the phone while using Preview to delete, you can watch them disappear. thank u … very easy.. Thanks for your tip Diane to unlock the iphone4 first before plugging to pc. This solved my problem on why I could not see my iphone in my pc. ok i have a problem.. my iphone is plugged in bt my computer doesnt have afile for it.. where else or what other method can i use to tranfer my pictures to the computer?? The ‘import all’ feature flat out does not work on my preview. It reads the iPhone just fine but it only imports one image at at time, and it eliminates the file name forcing me to create a name for the document rather than using the existing IMG_000.JPG name the file already had. Thanks! It worked perfectly and i was able to upload all 750 photos is 2 minutes. When I imported the pics and video from my iphone 4 to my laptop, all of the videos flipped to their side– thus making watching them less than enjoyable… They were taken right side up — I swear… Anyone know what I can do to flip them back to up & down?! I can’t download my pics. I have thousands of pics in my iphone but when connected to my pc, it has nothing on it. Help! O another thing, it says ‘no new pictures or videos found’. But I have lots of pictures and videos and some of those are new too, i.e. never been downloaded before. Thanks. Can’t believe how HARD Apple has made it for us to do something so simple. I was able to transfer photos easily from a phone to a computer 5 YEARS ago! No hassles. It’s 2011 ….. Why are they making it so difficult??? I have an iphone 4 & a mac g5. There is no import from iphone in the preview menu. I have Windows 7. Open Windows Explorer then ->computer then ->iPhone. RIGHT CLICK on iPhone and choose “import pictures”. Then a pop up box will appear and give you the option to erase them from your phone after copying to computer. What a backwards way to import them. Apple needs to fix this. 1. I have a 3GS I-phone that isn’t connected to a subscript ion and I would like to download my pictures. Is it impossible or must I have a subscription? 2. When I plugged in my 3GS I-phone, my computer doesn’t recognize the I-phone. Is there anyway of getting around this? 3. Diana (see above) indicated that you must unlock the phone but did not indicate how you unlock it. Can you tell me how its done? (When I click on start and try to find my phone, it shows everything except my camera (I-phone). What gives? 4. When I type quickly on my laptop, my cursor jumps to another field (area) on the computer. Is it case sensitive or is there something that I’m doing (clicking on a comma, for example) that activates another command? It is quite frustrating because I cannot type as fast as I’d like because I find out later that my cursor is on another sentence. I also have a 3G Iphone. if your computer does not recognize the iphone it is probabably the USB chord that you are using. Please keep in mind they dont last long. I can not tell you how many times I have had to replace mine, also I keep extra by my laptop. I have had many issues in the past with my Ipod and Iphone in terms of my computer not recognizing my devices. Try replacing your USB chord and see if that works. It worked for me. this should unlock your iphone all the time just like computer screen saver mode turn off inorder to stay on the main screen ….. Thanks so much….I wasn’t sure how to unlock the iphone, you explained it very well and it WORKED! Thanks again! I want to transfer pics form I phone 3 gs to sanding galaxy s 2 help ! I have tried all of these sugestions. I used to pull photos off of my 3G through windows explorer all the time, but none of this has worked on my new i4. The iPhone configuration will not even open on my computer. Any other suggestions out there???? I followed these directions provided early on in this set of posts and was able to get my photos off my iphone. However, I had previously deleted photos after “backing up” my iphone through itunes thinking that transferred the photos onto my computer. I cannot find them. So, does this mean that the “backup” is not accessible unless I restore the phone? what if i synched an album from a friends computer and i now want to access those pics? they arent showing up at all! plug in my iphone cun detect on my computer. go to computer only (C:), (D:) & (E:) theres no iphone found? have try not to lock my iphone also nothing case out? funny is when open itune my iphone found in itund. also my iphone is charging but cun detect from computer even adobe photo album to retrieve iphone also cun b found? After all that it turned out to be that I just needed to unlock my phone and take off all restrictions so that I could view it in “My Computer”. Thanks very much Diana and dunaskme. that’s the important part to unlock the phone… thank you so much…. I am becoming extremely bored trolling through arguments, that are basically semantic, in order to have someone confirm an idea i have (wether large or small) is this an age thing? Though i have now strayed from the topic myself now i was feeling desperate to tell you all to leave it out. It is not useful and even less entertaining. We know PC means Personal Computer but we also know that when someone says Mac or PC they dont mean Mac or Toenail, Egg or armchair or any somesuch. Lets get on with it, shall we? There comes a noise acknowledging the connection but I don’t see any symbol in ‘My Computer’ indicating that the iPhone is actually connected!!! i HATE this 3gs. tried all suggestions. computer does not show any sign of iphone. help please. Super cool! Never knew you could import photos with Preview. Thanks a ton! I am having the SAME problem but I am running windows xp home and dont know how to get them off!! Just tried it the way suggested, but no preview is showing up in the launch. Do you launch I-tunes? Couldn’t find it there either? Launch? Sorry don’t understand what you mean. When you connect the iPhone nothing launches. You have to open Preview. No you don’t open iTunes. ok, when i go to Preview > file , there isnt an Import photos from iPhone option. am i just stupid, or….? If you go to Preview > File you should see “Import From Scanner” and “Take Screen Shot”. The command you are looking for is above these two and on my machine it says: “Import from Steve’s…” where “Steve’s” is the name of my iPhone. I did notice that prior to connecting the iPhone it was greyed out and said “Import From Camera…” so I would suggest that if it still says that after you connect your Iphone it is a connection issue. I had the same problem. I made sure to have itunes closed when I plugged in my iphone and the option showed up. On my iPhone 4 I have around 14,000 photos and now I would like to get them copies/transferred to my new iMac computer. Due to earlier copying/importing to another PC about 11,000 of the photos are filed in “albums” on my iPhone and those photos are not visible on neither my iMac or Windows PC, so I can’t transfer them. Help! (only the about 3000 photos on the “camera roll” can be found and transferred to the iMac and Windows PC). Thank you!! Wow, that was easy!!! Why doesn’t Apple tell us these things?????!!! Ive always connected usb cable from ipod touch to Win 7 to copy off photos, but today when i did it, it shows the original 520 photos, but doesnt show the most recent 30 at all as if they dont exist, yet they do exist on the itouch and work perfectly. What could be happening? Anyone have this problem? What is the fix? Ive been testing and it seems that NO NEW photos added to my itouch can be copied off ever again. Really sad. Im starting to hate Apple. Any suggestions? who cares, seems like you fella’s how plenty time to waste. Either Windows, Linux, Mac based PC will do. You save me a LOT of time, good article. Can you people be more civlized and not call each other names like idiots and morons and the like. Even if you are smarter and know the answers. Some are trying to help and may not be exactly right. Thanks JJ- That finally fixed my problem of not being able to see the pictures in the folder even though I could see the iphone itself! You people must be having fun with this non-issue. You either have a Mac PC or a Windows PC or even a Linux PC. Get it ????????????????????? I agree this is a non-issue, and I agree that a Mac is a type of PC. However, nobody ever actually SAYS “a Mac PC” do they? And the common usage of “PC” to mean “PC which is not a Mac” has probably earned the status of secondary definition by now. Thanks for the info. It was very helpful. Too bad you have to put up with all the fools on this site. OMG! I was petrified about saving my photos! You are a lifesaver. Now if iTunes would just stop syncing genius data for my purchase transfers, I could complete the process. :) Thank you again! Hi there, which version of preview is what u put up the screen shot of`? My issue is I have a windows xp home edition and before I wiped my computer I took all the photos and added them to my iphone now I am trying to take them off and I cant! I need to update my iphone and cant do it or it will wipe all my photo’s!!! So when I go into my photos on my iphone 4 there are 2 albums one from when I imported the pics from my computer called photo library and the other one holds the pics from what I take from my phone called camera roll. It made 2 separate folders in my one photo album. HELP! I need to get off 3391 photos from my phone! Thanks!!!! This was a great help! I have an iPhone, and a Mac. I’m trying to get my photos off my iPhone. I’ve tried your directions in Preview three times already. Nothing happens after I select all my photos, and click import. Am I doing something wrong? I’m getting kind of frustrated with Apple, seems like they often sacrifice the functionality of their products for look. Why the hell is it so hard to get my photos off of my phone? You sure you didn’t already import them and they’re in your Pictures folder? Use iPhoto – it will recognize your phone, select all or some of the photos you want to transfer and hit import button. Preview did not work for me either. thanks for the helpful post. this was so much easier to understand and do than some of the other advice out there for photo imports from an iphone to any computer. Your guidance is very helpful. This is the best advice on the net. How to import the photos from other albums(not camera roll)? Jeez, all you turds debating what a PC is or isn’t are just well… turds and while its a good laugh it takes away from what this post was meant for and that is to help people. Get a life! Thanks for the advice(: worked great! And P.S. For all you who think you’re so smart and can argue and call people names over the dang web, hiding behind a computer screen, you’re all stupid. Let’s think about this and grow up. This is great , THX! it wont popup if ur cell is locked., !! OMG! I was going crazy already! The app I downloaded didn’t do much! I am so glad I found your site! THANK YOU so much! Yet another endorsement for the Mac’s greatest and most unsung app.. Preview! Wow. Finally able to move my pictures off. That was way too difficult. Well okay only minorly difficult, but it should be simple. And still most of the phots are rotated the wrong way. PS Apples are pc not PC. No matter what the fanboys say. To get in on the debate on the use of the term PC. I realize that PC stands for Personal Computer. But it actually is short for IBM PC, which was a specific brand. Unlike Apple (Mac), which was proprietary, IBM opened up it’s technology and therefore there were IBM PC-compatible computers, which was shortened to PC-compatible, then to PC. So based on the history of the term, that is why a PC & a Mac are actually considered 2 different things. Everyone here has been putting in their two cents about these terms. Here are the facts. Macs are easy to use. They are for people who are stupid. PC’s are for smart people. Those are not facts. That’s pure ignorance. Because something is more difficult to use doesn’t make it for “smart people”. In fact, if you were a smart person, and you had the choice between 2 machines, one being easier to use, you would certainly choose the easier machine. That’s really just common sense. Opting for something that’s more difficult solely for the sake of it being more difficult is stupid. That is what a stupid person would do. By the way, I use both Mac and PC. So I don’t really care. I’m just saying whoever wrote this comment is pretty dumb. OK- have tried as directed (to copy photos on iphone from PC) but when opening IPhone file from a PC – the file displayed nothing – nothing in file… no photos, etc… although I have 300 photos on iphone. Do I need to change a setting on the iphone? Have taken the advice and when the photos folder opens it only shows photos i have taken with my phone and not the other photos i transferred onto my phone after a recent laptop crash. How do i transfer those to my laptop?. You guys are all idiots…it’s just a distinction…so they can give you instructions on how to download pics from iPhone to either a Mac computer or a PC! Geez Louise! Why does it show “0 items” on the iPhone when there are photos there? Please help. I tried the simple way using USB cable to transfer photo from iphone to my PC but as i open my computer the camera do also appear but no nothing appear in that folder. pls help me suggest what to do.? You are a life saver thank you !!!! thanks so much, you are the best! This worked, except when the phone locked, so I had to keep unlocking my phone to continue uploading the pix. One solution to this would be to extend the time for auto-locking the phone. I wanted to avoid using the iTunes setup since I think you have to sign up for iCloud first or some other kind of extra steps – too complicated. Plus, I don’t want to have my photos floating around in cyberspace – no privacy. Conclusion: iPhoto works great, just make sure to keep your phone unlocked or it pauses during the uploading process. Good luck, everyone! This is all fine and dandy, but trying to delete photos from the iPad is a nightmare. Have researched on the web extensively and not found any method that will work for a large number of photos. i got a q. my pc says there are no new photos to import. i know this to be a lie. why is it lying to me? Really it was very useful!!.. Thanks, 2nd option worked without iTunes for windows OS. I saved my iPhone photos to my Mac using the directions above. Came back later hoping to save subsequent files in the same way, but all that appears in the box are the photos I had previously saved. Why don’t I see the newer ones? Thank you so much. I had all these pictures and was concerned that they would be lost. I have Windows XP so I can’t use iCloud. How do I copy my videos from Camera Roll to my XP computer? Is there are 3rd party app for that? I have no problem with photos, just the videos. Tried moving videos from my 4S to my Mac using the tip give, but kept getting an error message: . Any help? GREAAATT – Thank you – i was so sick of waiting for iphoto to load and freeze after 3 hours of transfer! are u mad i need to transfer my image through i tunes …..apps tel me some other idea ….. Easiest way is to have a dropbox account. (Dropbox.com) once u set up an account u can put the app on your iphone. Its great cause u never have to connect your phone to your computer. It will just transfer you photos into a folder on your computer automatically when you want it to. Its kinda like icloud but u can store lots more and its easy acess to them on your computer. Thank you sooo much! The best instruction i’ve researched! I needed to remove 450 photos from my iphone to my computer. I plugged in my iphone and via windows ( I followed the instruction on the box that poped up and cliked to erase pictures from iphone when download was completed.) I cannot find my pictures on the computer and they are no longer in my iphone. Can you help to find my pictures? The easiest way I found to transfer as many photos as I want from Iphone into mac is to connect the phone. Then, you need to launch the Preview application, go to file and export as many photos as you want to a specific file. Hope this helps. how can i transfer a photo from iphone 4S to my pc without a USB data cable..??? Thanks for keeping it plain and simple!!! omg – This was so dang simple I can’t believe how much time I’ve spent cursing Apple and looking for a way to save photos taken with my iPhone. I use Windows Explorer constantly for other things … don’t know why this didn’t occur to me. Solved a big problem, now non-existent. THANK YOUUUUUUUUUUUUUU! Perfect advice! Attached to pc, opened my computer, simply copied all to a folder…entire process took less than a minute! Thanks for the great advice! Great advice!! Works like a Charm thanks for sharing!! this advice works very well.. been longing how to do this and this advice helped me a lot.. Thanks! Thanks! I looked at another website and it required to download some app or something, but your suggestion literally took seconds! When I plug my iphone into my computer. a pop doesn’t come up. The first time I ever plugged it in, a pop up did show, but then a day or so later I plugged it in again wanting to save photo’s but there was no pop up? and there still is no pop up coming up?? Hi, I have a quick question; maybe my “Preview” program is not quite up to date. Rather than “Import from iPhone” it says “Import images,” which is obviously not a problem, but it was my first clue that something would be slightly different. More importantly, I see no “Select all” option and I cannot use the command or shift keys to select multiple images. Am I really going to have to import only one image at a time?? what can I do if by plugging to my comp my iphone directly opens itunes, and my iphone device is not being showed in my computer?? I gotta tell ya, I am frustrated….I took a bunch of photo’s of our church after I decorated it for Christmas, plus a few Christmas Block Parties we did for the kids in the neighborhood, now I can’t get them off of my phone so I can print them and put them in our photo album. My computer is recognising the phone, but it is not showing any of the photo’s I have in my gallery. How do I fix this? I don’t want to lose these pics!!!!!!!! !Someone please help. Great advice. Couldn’t understand why I was unable to perform this directly from iTunes (where it syncs). But preview was exactly what was needed. Thanks! This really helped. Quickest and simplest solution EVER! i am having trouble with my pics on my iphone, i am trying to import them to my computer to open up more room on my phone, but i am not having any luck what so ever, i thought i was doing it right but then after i thought i was successful i looked at my phone in the camera area and i saw it copied my pics and then added them back in like triple and copies, and it isnt letting me delete the ones it added what do i do?? please any advice would help me out greatly. I’m trying to transfer the photos stored in the iPhone folders OTHER than the “Camera Roll” folder. The thousands (literally) of photos I need transferring from my old iPhone 3 to my PC, are all in separate folders. PC to iPhone photo transfer is easy, but I can’t fathom how to reverse it when the photos aren’t located in the Camera Roll. As far as I can tell, you can’t even move the photos from the separate folders to the iPh 3 Camera Roll , or am I wrong? My iPhone is unlocked when connecting to my Windows PC, and I can see all the pics in my Camera Roll, but not the pics in the other folder. I hope there is a way to solve this, as these photos are very sentimental to me. You can use Dr.fone to recover lost data/photos/contacts from your iPhone. I realy need this info. If the iPhone has a password locking the device it may need to be unlocked before the photos can be transferred. This depends on your security settings of course. Family sends me photos in messages. Please send me the steps to get these photos off my iPhone/iPad onto my iMac computer. Thanks you. Plug the iPhone to computer and begin transferring photos to PC by treating the iPhone as a moveable disk is the easiest way! But if you don’t bring the data cable, what should you do? To transfer the photos from iPhone/iPad/iPod without cable, Dropbox is a good tool to help. 1. Install Dropbox app onto both your iPhone and your PC. 2. Then open the Dropbox app on your iPhone and switch to the Uploads tab. 3. Press the + icon at the top left corner and select the photos you need to transfer. My phone is plugged in and unlocked but doesn’t show up at all when I go into “Computer” I followed another websites advice by having my phone plugged in, and opening windows live photo gallery and choosing the option to import photos but once again my phone does not show up as a device I can import from, only my printer shows up.. Is there anything I’m doing wrong or haven’t done so that it will work? Thanks for posting this, so easy. Didn’t know there was such a thing as image transfer in osx. Even for a long time mac user. Always used iPhoto but this is so much easier! I’ve done all this. I have too many pictures and need them off pronto. I’ve “unlocked the phone” and plugged it in and tried to “close itunes” but it automatically pops up every time my iphone is plugged in. I can’t open the device in documents and I’m so confused for what to do. I’ve tried for hours. Is there a software that will automatically download photos from any phone plugged into my mac? Maybe I should use some transfer tools. Please recommend some tools which can transfer photos from iPhone to PC, so far I just find the FonePaw iOS Transfer. Er… It’s OK enough. But I want much tools for instead. WHAT and WHERE the hell is ^^^?! After I transferred my pictures from my iPhone to my PC they display sideways on my screen. How can I fix this? Many times, I plugged into my iPhone but Windows autoplay didn’t pop up and no iPhone icon appeared in Windows Explorer even though I refreshed over and over. So, I tried third-party photo transfer app. WinX MediaTrans is what I’m using now. It works well. Every photo can be copied to my PC easily. Thank you so much! New Mac owner, was being driven to distraction by the horrible articles Mac had on the subject. No, I do not want my photos stored in a “library” file, I want access to my actual image files so I can access them regardless of OS. These instructions worked to get the actual files transferred over. You rule. Guys, just do us all a favor: if you have a mac you know that procedures are different from a windows pc/any pc. Therefore, it’s helpful for those on a mac to avoid instructions/remedies for pcs because it’s simply not the same! So get over it, and say PC if it’s not a mac, and say mac if it is a mac!!!! Yes anne, if you read this article you will find there are different procedures for transferring photos from iPhone to a Mac versus to a PC. You have to READ THE ARTICLE to find that though, not just comment. Thanks so much, this helped me get it to work! !